/ Modified jan 25, 2016 5:26 a.m. 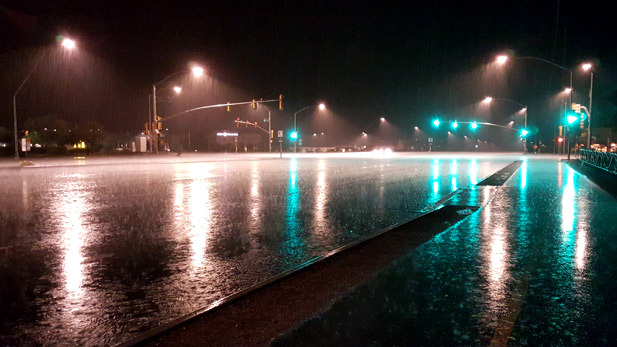 Heavy rainfall from a monsoon storm floods an intersection in east Tucson. The latest report from the U.S. Drought Monitor showed Pima, Santa Cruz and Cochise counties are drought-free for the first time since November 2010. It also shows 16 percent of Arizona is in drought status, and that portion is considered in "moderate drought." National Weather Service meteorologist Ken Drozd said a strong monsoon and storms caused by a strong El Niño weather pattern have helped. But, in the desert Southwest, drought can come back just as quickly as it went away, Drozd said. Drozd said wet conditions have been the exception and not the rule in recent years, so residents should remain aware of their water use even during times of heavy precipitation. And, while areas officially considered in a drought have lessened around the state, it does not mean the area is completely free of water worries. More than half of Arizona is still classified as "abnormally dry" by the U.S. Drought Monitor.